The adult male is the only violet-throated hummingbird naturally occurring in the US with a green crown and a deeply forked tail. 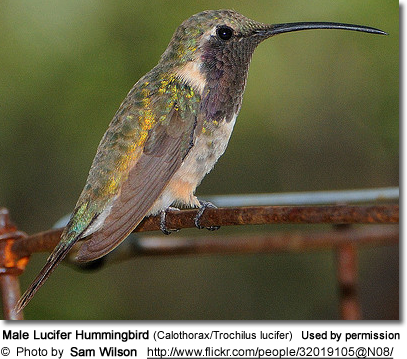 The adult female is the only hummingbird naturally occurring in the US with a buffy throat, down-curved bill; thin white patch behind eyes and white tip on the unforked tail. The Lucifer Hummingbird is medium-sized Hummingbird that averages 3.5 inches or 9 cm in length - including its long bill and tail. The average weight is 0.10 - 0.11 oz or 3 - 4 g.
Males weigh about 0.10 oz (2.75 grams). Females average 0.11 oz (3.08) grams in weight. Females are generally a little larger than the males. 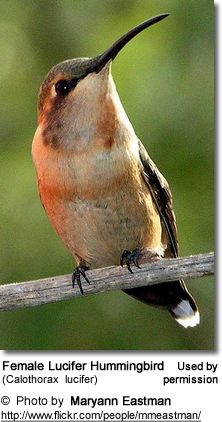 Its most distinctive features are the large head; long, thin and down-curved bill; small wings and small, tapered body. The tail is long and narrow, extending well beyond the wingtips. The forehead is green and the back is a drab grey-green. They have a pale buffy band across the chest. Both males and females have a white streak behind the eyes. 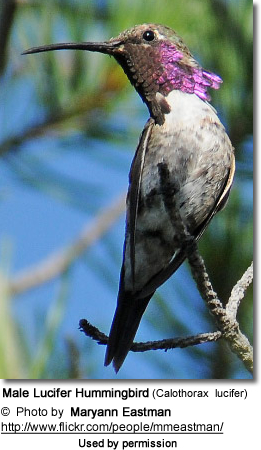 The male has a glossy magenta to blue-violet throat patch (gorget) that is elongated at the sides and is bordered white on both sides (note: the purple gorget looks black in poor light) . The neck and the chest are white. The under plumage is whitish / greyish with greenish and rusty sides. Long, black, deeply forked tail. The female lacks the flashy throat patch of the male. She is light brown around the chest and throat area. She has white-tipped green tail outer feathers with a rusty base and black middle. Juveniles generally look the female. Immature males show a few spots of purple on the throat in the late summer, as they molt into their adult plumage. The male resemble the Black-chinned Hummingbird; except the Black-chinned has a less extensive throat patch and its bill has less of a down-curve. 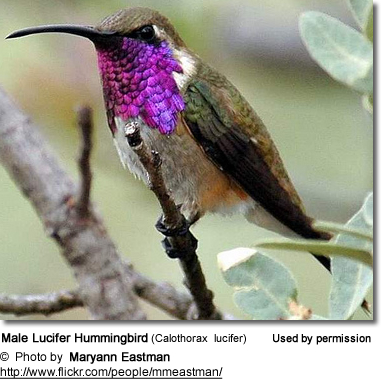 The male Lucifer Hummingbird's throat patch color is most similar to that of the Costa’s Hummingbird, but the Costa is heavier-bodied, has purple feathers on top of its head, and has a shorter tail. 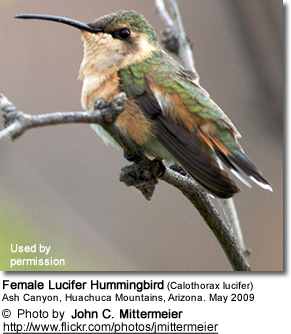 The female can be differentiated from other female hummingbirds by her brighter buffy chest and throat. Those that are most similar are the female Rufous Hummingbirds, Allen’s, and Broad-tailed Hummingbirds, but on these, the buff coloration is more concentrated more toward the undertail than the throat. Its longest recorded lifespan in the wild was was 4.1 years. Like other Hummingbirds, Lucifers tend to hover and make quick, straight flights between perches, the nest and foraging areas. There is no social bond between adults and their independent young.